Our guest today is not here to celebrate a birthday, commemorate a death or even remember an anniversary but is, instead, the result of a conversation I have been having with regular visitor to the salon. He has an interest in the political career of Viscount Barrington and for that reason, I was happy to feature the Viscount today. Born to John Barrington, 1st Viscount Barrington, and his wife Anne, William Barrington enjoyed the best of everything in childhood. His education was truly privileged and he was schooled in Geneva, inheriting the title of Viscount Barrington in the Peerage of Ireland at the age of 17. Newly ennobled, the young man undertook a tour of the continent, learning something of the world before returning to England to settle into society life. Barrington married Mary Lovell in 1740 and this same year he succeeded his father as Member of Parliament for Berwick-upon-Tweed and later for Plymouth, making a splash in the Commons. Six years after taking his seat he was appointed one of the Lords Commissioners of the Admiralty, swiftly rising through the ranks to become a Privy Counsellor and then Secretary at War under Newcastle's cabinet, a position he held throughout the Seven Years War. Barrington's career was in full flight and his next office was that of Chancellor of the Exchequer and Treasurer of the Navy. However, his true political interests were elsewhere and when he returned to the position of Secretary at War in 1765, he remained in this office for 13 years. The Barringtons had no surviving children and Mary died in 1764. 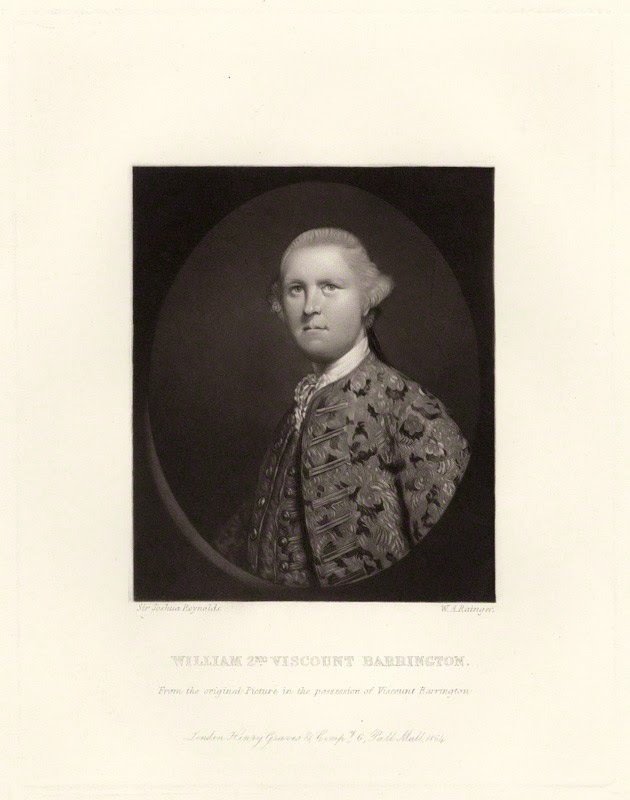 When Barrington himself died in 1793, less than ten years after his retirement, his nephew succeeded him to the title.